Published: March 8, 2013 at 11:46 a.m. Updated: March 8, 2013 at 05:59 p.m.
SYRACUSE, N.Y. -- Is Ryan Nassib really a franchise quarterback? That's the question weighing heavily on the minds of coaches and scouts as they put the finishing touches on the evaluation of the Syracuse quarterback. Whereas some evaluators view Nassib as a franchise player with great intangibles, gridiron savvy and a brilliant football mind, there are others who view him as an over-hyped prospect with limited tools and potential. Given the wide disparity of opinions on Nassib within the scouting community, I made the trek to Syracuse to attend his pro-day workout to see if I could unearth some solid answers. Nassib displayed only adequate arm talent on film. He doesn't possess the big arm that would allow him to make "pro" throws from hash to opposite sidelines, but he is capable of making all of the short and intermediate throws in most offenses. At Syracuse, he played in a quick-rhythm passing game that extensively featured bubble screens, quick routes (slants and seams) and a variety of intermediate routes within 15 yards of the line of scrimmage. Nassib routinely played from the shotgun, which allowed him to quickly field the snap, pivot and fire the ball to the perimeter without taking additional drop steps. When asked to push the ball down the field, Nassib would execute three-step drops from the shotgun and rely on precise timing/anticipation to complete throws, rather than superior arm strength. Nassib was fairly accurate on short and intermediate throws, but his ball placement was more erratic on throws beyond 15 yards. He routinely tossed the ball high or on the incorrect shoulder, which led to a few turnovers and poorly thrown incompletions. While some of Nassib's inaccuracies can be blamed on his inconsistent footwork, he simply doesn't possesses the arm talent to make pinpoint throws without being mechanically sound on every down. In the NFL, elite quarterbacks must be able to maneuver effectively within a collapsing pocket. Even non-athletic quarterbacks like Tom Brady and Peyton Manning display the lateral quickness to sidestep rushers while making accurate throws downfield. Nassib is not an explosive athlete, but he moves well within the pocket. He will step up to avoid rushers, or sidestep them, and deliver passes to receivers on the perimeter. Now, I would advise Nassib to eliminate the improvisational pitches and tosses to receivers executed on the run, but those highlight plays showcase some of his potential as an athlete. Nassib also displayed adequate athleticism while running a handful of read-option plays for the Orange. While he definitely is not a running threat capable of breaking big gains with his legs, he can move around enough on the perimeter to keep defenders honest on the play. With the concept trending well in the NFL, the fact that he had some positive gains executing the play is a plus. Between the combine and the draft, prospects work out for scouts at individual pro days at their respective schools. Full schedule. Nassib scores high marks in all of the football intelligence and intangibles categories. He is a three-time member of the Big East All-Academic team; coaches can't stop raving about his leadership, intelligence and awareness. Nassib directed the Orange's uptempo offense with poise and precision, routinely running the game from the line of scrimmage. He changed plays based on anticipated defensive fronts and coverages, which allowed the Orange to remain productive on offense. Nassib also shows the capacity to make solid decisions with the ball as a passer. He has a strong touchdown-to-interception ratio (70:28), and he repeatedly showed the capacity to keep the ball out of harm's way despite facing heavy pressure. Given the significant impact of turnovers on the outcome of games, the fact that Nassib excels at managing risky throws reflects his understanding of the game. One of the most important traits for a quarterback in the NFL is an ability to deliver in the clutch. Teammates respect signal-callers with the capacity to engineer in-game turnarounds or carry the team on multiple-game winning streaks. Nassib displayed both qualities as a senior by helping the Orange overcome a dismal 2-4 start to finish with six wins in the final seven games. While some would point to the increased utilization of the running game as the primary reason for the turnaround, I would contend that Nassib played his best football down the stretch. He posted an impressive 15:2 touchdown-to-interception ratio over the final seven games, which indicates his efficiency and effectiveness running the offense. Most importantly, he made enough plays for his team to win when it counted. Although most quarterbacks cringe at the thought of being tagged as a "game manager," the ability to guide a team to wins in dire circumstances makes a player clutch, in my mind. 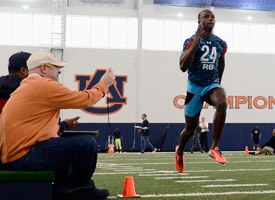 Check out all the action as NFL prospects work out for scouts. Nassib's 75-pass workout at Thursday's pro day was designed to showcase his strengths as a player. Former NFL quarterback gurus Ken Anderson and Paul Hackett scripted the workout to show off Nassib's ability to throw effectively from the pocket and on the move. The Syracuse star started out with a series of agility drills and throws that displayed his quickness and body control as an athlete. He scooted through and around bags before making tosses to stationary pass catchers on the perimeter. He completed 12 out of 12 in this drill. Nassib moved on to a series of quick-rhythm passes that required him to catch, pivot and fire to receivers running smoke screens, slants and quick outs. He was fairly accurate on those tosses, but occasionally would deliver the ball high. Nassib also tossed a variety of seams, quick ins and stick routes over the middle of the field from under center (three-step drops) and shotgun. His retreat and setup was quick and efficient; he displayed accuracy and touch on those throws. However, scouts questioned whether some of the throws would've been completed in game-like situations with an offensive line in place due to the low trajectory. Nassib attempted to address concerns about his arm strength, accuracy and touch with a series of intermediate and deep throws. He hurled a few deep balls down the sideline on go-routes, which revealed his maximum range at 45-47 yards. Nassib also struggled with his ball placement and touch on deeper throws. He didn't consistently drop the ball down the chute on the intended receiver's outside shoulder, and failed to hit receivers in stride on the deep post routes. Additionally, Nassib raised more concerns about his deep-ball ability with his high-arcing throws on the perimeter. While he executed those throws in the comfy confines of the Orange's practice facility, the thought of those throws working in inclement conditions must be considered in the evaluation. Nassib wrapped up the workout by throwing a variety of intermediate routes on the run. From bootleg and roll-out comebacks to a variety of play-action corners and crossers, he attempted to show his capacity to make "pro" throws by driving the ball on the move. Now, he certainly looked good in those drills, but scouts never had the opportunity to watch him throw from the hash to the opposite sideline. Although rolling out to complete comebacks is definitely a part of some offensive schemes, the majority of pro systems require the quarterback to make deep outside throws from the pocket. For Nassib to eliminate the concerns about his arm strength, he must show this ability in private workouts over the next few weeks. After digging through the tape and reviewing the workout, I believe Nassib is a Day 3 pick (Rounds 4-7) in most drafts. He is a developmental prospect with the potential to emerge as a solid backup/spot starter in his career. I would compare him to Ryan Fitzpatrick or Matt Flynn; two players who have received starts in the NFL, but lack the physical ability to be long-term solutions at the quarterback position. Nassib is a good college player, but I don't see him as a franchise quarterback, despite all of the positive buzz about his game since the middle of last season.